About two years ago I bought an ancient, rusted diesel Mercedes that had been converted to burn veggie oil. It was so cool at first. I got a lot of support and admiration in the Whole Foods parking lot. The kids of course hated it, but I thought they might come around, especially when I offered to set them up in the oil business – buying fried chicken grease from local restaurants, hauling and processing it at home with an electric grease filter, and selling it to us for a profit. Shockingly they declined. Not only that, they soon stopped riding in the car, once electing to walk the three blocks to school in a relentless downpour rather than be seen in my sweet veggie car. That was truly a low point. But looking on the bright side, I’d inadvertently hit on a powerful incentive to get them walking, which is a solid low-carbon alternative to carpooling. Things continued to go south with that car. My husband and I never got the hang of keeping the grease filters clear of debris and the engine routinely clogged and stalled, once on the Mass Pike on my way to New York. Drivers cursed and honked as I sputtered along at 20 mph. I desultorily switched to dirty (petroleum) diesel for the rest of that trip, and when I pulled into my sister’s toney Westchester driveway, she heaped insult upon injury, asking me to park down the street. I felt vindicated when her friend, a restaurateur, dropped by in her veggie Benz and offered to show me how to keep the filters clean. But she got too busy at work and never made it back. I burned carbon all the way home. Meanwhile, my older son’s indignant prediction that a 30-year–old car would have many mechanical problems, no matter how avant garde its fuel system, turned out to be true. We had brake and axle problems; the first winter the defroster either barely worked or blew so hot, the car felt like a sweat lodge. Bad headlights, old tires, terrible suspension, not to mention sagging seats. The enthusiastic early-adopter crowd who’d talked me into buying the car had skipped over these details, focusing instead on how durable the diesel engine would be. But on my last trip to New York this past Christmas, the car suddenly filled up with the smell of diesel fuel. My poor dog, who’d come along for the ride, threw up all over the back seat. I was done. Shortly thereafter, at the second hand furniture exchange (the eco-sensitive home décor solution), the store manager expressed interest in buying the car. We warned her of all of the mechanical problems including the diesel fuel smell. Undeterred (a mechanic friend would fix the car for her, gratis) she said she was quite eager to embark on her own green grease adventure. We decided to give her the car. Now we are just waiting for her to call us back . I am still inspired by Rudolph Diesel’s original idea that people should be able to grow their own fuel, but I have realized that the technology must further evolve before I can embrace it. Soon after this sad realization, my dear friend came by in her sleek and stylish new almost-zero-emission BMW diesel. I was thrilled to discover that the technology has already evolved, just not for us regular folks. When I enviously (that other shade of green) told my husband about her car – he only agreed to the grease car to preserve domestic tranquility – he quipped that for all the money we spent repairing the grease car, we could have leased that lovely ride ourselves. Ouch. Licking my wounds and waiting for BMW technology for the masses to arrive, I’ve moved onto simpler pursuits. 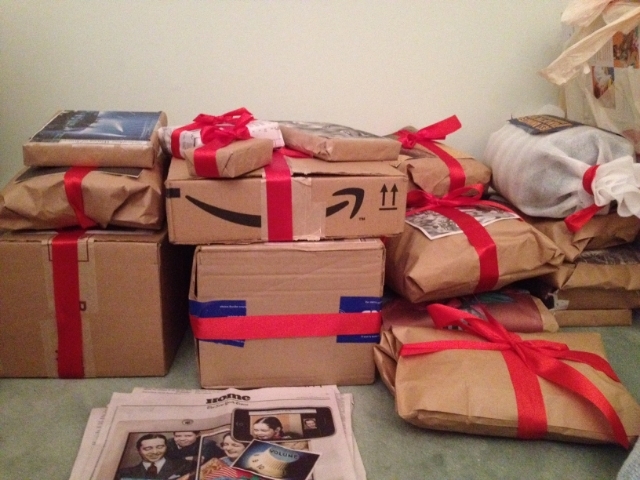 This past Christmas I had the inspired idea to wrap all of my gifts in trash. No ridiculous reams of red wrapping paper to feed the landfills; I would use old newspapers, packing filler, string and other found objects to adorn my holiday offerings. Never one to skimp on innovation, I further decided to carefully match the newspaper clippings and other trash to the recipient’s hobbies and personalities. No junky nametags on my gifts. Instead, my family would get to guess which gifts belonged to whom. Christmas morning would become a fun and exciting, not to mention ecologically correct, guessing game. It took me hours to cull through the newspapers, find relevant pictures and then to carefully cut and piece together the lovely wrappings for each gift. I barely had time to help my mother and sister with preparations for Christmas dinner. On Christmas day, pressed to get food on the table, we had less time than I’d hoped to open gifts. And speaking of the Masses (as my husband affectionately calls the kids), they were none to pleased when I announced the game. But it was Christmas morning and somehow good cheer prevailed. My older son came around first, managing to accurately guess that the box with the newspaper photo of a man huddled in a tent with a hungry-looking bear prowling outside, was for my husband – a reference to the three-week Alaska camping trip he lovingly organized and herded us through this past summer. The pictures of football and stock indexes were a dead give-away identifying my younger son, the jock-future-investment-banker’s gifts. The kids stopped believing in Santa a long time ago. But, at least for me, that little 15-minute guessing game brought back a touch of the excitement and anticipation of the Christmas mornings when they still did – back in the day when the gift boxes were almost more satisfying than the gifts themselves. The kids would turn them over, climb in and out of them and play with the packaging. By the time they got to the gifts, they were barely interested in them. Hey, wait a minute . . .
Maybe next year, no gifts, just boxes! A bold strike against consumer culture, a clear declaration that we are part of the 99% ! A smart way to stimulate the teenagers’ imagination and creativity! A new chapter in my quest for green! I think I’m really onto something. Don’t you? Dayna Cunningham is the Executive Director of the MIT Community Innovator’s Lab. Oh gosh. Thank you for sharing this hilarious story. Going green is funny! Also, I am so glad that car is kapootz (sp? ).